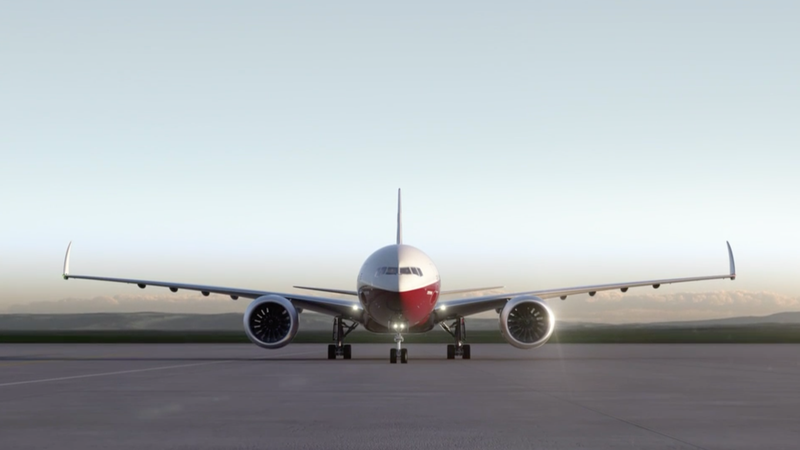 The wingspan of the upcoming versions of the Boeing 777 series commercial plane is so big it can’t fit at a standard airport gate, so the company had to get special approval to engineer wing tips that can fold up after landing. Folding wings isn’t a new concept—many military aircraft feature folding wings to accommodate for the cramped storage space on aircraft carriers, for example—but it’s new to the commercial planes that most people are familiar flying with today. Boeing’s 777 has a full wingspan of 235 feet, which is extremely wide when compared to the 787's 197 feet and the 737's 117 feet wing spans. Because of this, the planes can’t fit at a standard airport gate the current 777s use without some adjustments. 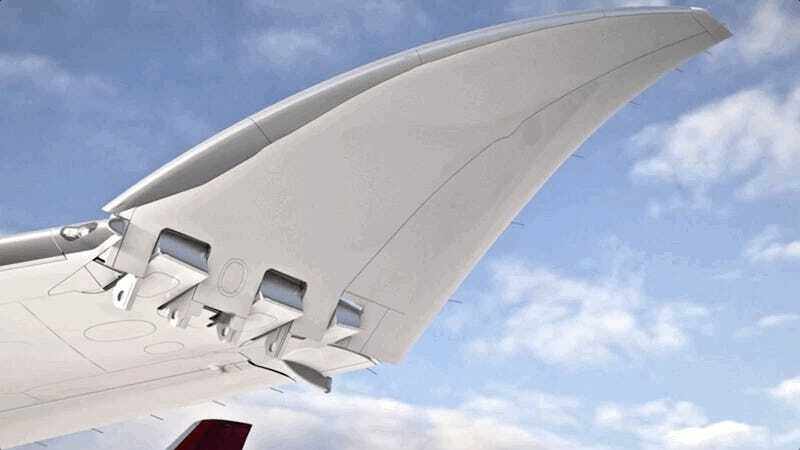 Instead of getting every major airport in the world to adjust to the new plane, Boeing instead opted to get special approval from the FAA to develop hinged wing tips that can fold up when the plane is on the ground. With the tips folded up, the wingspan drops down almost 20 feet in width to nearly 213 feet. These longer wings, which are made of carbon fiber, are more fuel-efficient. “It’s all because it lowers the drag,” says Gary Ullrich, an associate professor at the John D. Odegard School of Aerospace Sciences at the University of North Dakota and a former Air Force pilot. He’s also a coauthor of the textbook Aerodynamics for Aviators. Longer wings, Ullrich says, cut down on the vortices, or wake turbulence, that can form at the wingtips, which is why these lengthy wings slice through the air with less drag, saving fuel and thus money. The FAA points out in its Special Conditions document that the folding wing ability will only work when the plane is on the ground, and that the company does not plan to store fuel in the folding sections. And since it would be disastrous if the wingtips were to fold in flight, or if the plane were to try to take off with the wings not in the proper position, Boeing has to take the design aspect of this new feature very seriously. Boeing claims the new 777 is the “most-efficient” twin-jet commercial airplane ever developed, thanks in part to the new wing design. The wings are also made of composite materials including carbon fiber. The new planes will likely eventually be labelled the 777-8 and 777-9, with the capability of loading up to 375 and 425 people, respectively. Boeing expects to start flying the new planes by 2020.